i learned yesterday of the simple magic that is the transformation of lemons and eggs and sugar into the zesty, smooth creaminess of lemon curd. i settled in with a stack of cookbooks to find inspiration for a quiet new year's meal at home. i wanted something seasonal, not too fancy (i'm still exhausted from the christmas cooking), but which would feel rather fancy and special. so, in that kind of mood, i turned to nigel slater's the kitchen diaries. i turned to the end to see what he did at the end of his year. he too must have been a bit exhausted, as there's no new year's menu in the book, but there, on boxing day, i found a recipe for a passion fruit roulade. nigel uses ready-made lemon curd, but although i was feeling a bit lazy, i wasn't too lazy to contemplate making my own lemon curd (mostly because i figured i'd have to go in to copenhagen to find it). so i searched a bit in the rest of the stack of cookbooks i'd selected and sure enough, in jam it, pickle it, cure it, there was indeed a lemon curd recipe and it looked dead easy. the hardest part was squeezing 10 lemons and that was my exercise for the day, so even that was ok.
zest of 2 lemons, removed in large pieces with a vegetable peeler. prepare a clean jar or jars to store it in. my large jar above (i think it holds a 850ml) held the whole batch, save one small bowl of it which i left out (and may have eaten by the naked, delicious spoonful over the course of the evening). in a large saucepan, with a whisk, beat the whole eggs and egg yolk together thoroughly, then whisk in the sugar and lemon juice. be sure the sugar has completely dissolved before you start to heat it. i actually did this mixing in my kitchen-aid and then transferred it to a pot, but that's because i like the machinery to do the hard work for me. place the pot over medium heat and gently warm the mixture. after 3 minutes, begin to add the butter, stirring constantly. add the zest pieces as well. whisk constantly for 7-8 minutes until the butter melts and the mixture becomes very thick. pour the curd into your prepared jar and let it cool, uncovered. remove the zest and discard. store in the refrigerator after it's cooled down. it should be fine in the refrigerator in its jar for at least ten days. i'm going to use mine in nigel's passion fruit roulade, but you can also slather it on a homemade scone and have it with your tea. i haven't made the roulade yet, so no pictures of it. maybe i'll update later when i've made it. line a shallow baking tray (36cm x 30cm) or jelly roll pan with baking paper. separate the eggs, putting the yolks in one bowl and the whites in your mixer to beat them 'til soft peaks form. add the sugar to the yolks and whisk until they're pale and creamy. 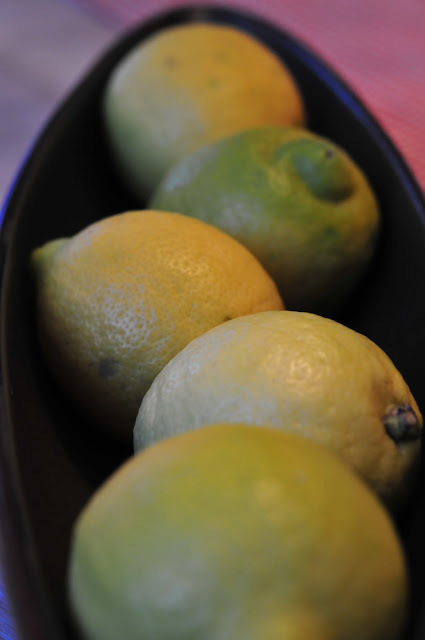 grate the zest from both lemons, then juice them. folk the juice and the zest into the yolk-sugar mixture. add the flour to the yolk mixture. then fold the entire mixture gently into the egg whites. it's important not to over-mix. pour into the lined baking tin, spreading it out to the edges. bake for ten minutes until the top is very lightly colored and feels softly set. allow it to cool for a few minutes. put another piece of baking paper down on your work surface, sprinkle it with caster sugar and turn the roulade out onto it. carefully peel away the baking paper from the bottom and discard. cover with a clean tea towel and allow it to cool down. once it's cool, spread the lemon curd carefully over the surface. meanwhile, whip the whipping cream until the soft peak stage and then spread it over the curd. cut the passion fruits in half and spread the juice and seeds over the cream. you can reserve a couple of passion fruits to squeeze over before serving. on the long side, roll it carefully into a roulade. transfer it to a serving dish and dust it with powdered sugar. cut into thick slices and serve. this will be our dessert this evening for our low-key new year's eve dinner. in addition to it, i'm stuffing a beef roast with a nigella-inspired stuffing of bacon, dried cranberries, garlic, shallots and thyme, making ordinary roasted potatoes and a green salad to go with it. we'll drink a nice amarone and bring in the new year in a very relaxed fashion. see all that lovely whipped cream/lemon curd/passion fruit there on the side? well, it's not there anymore, thanks to me and my spoon. this is gonna be a good cake. happy new year to all of you and thank you so much for your comments and sharing your enthusiasm for food since we started this little venture back in september. we look forward to much more cooking in 2010. On December 23rd, my husband and I braved the icy streets of our nearest market town to pick up our turkey and other Christmas feast groceries. Although the pre-ordered turkey was the biggest size (14 pounds) that could fit into our (fairly small) oven, my husband panicked that it just wouldn't be big enough to feed the 10 of us sitting at the Christmas table. (What is it about Christmas that makes us all wildly over-cater?) So we bought a large ham, too. On December 26th, I had the following left-overs in the refrigerator: half a 14 pound turkey, two-thirds of large ham, nearly half of a large dish of sausage/walnut/apple/chestnut stuffing, a dish of cranberry relish, brussel sprouts, broccoli and carrots, and a vast tub of gravy. Lunch: turkey sandwiches, of course. When I was a child, I enjoyed a small slice of turkey on a buttered roll. Now that I am a larger, more gluttonous person, I realize that the proper turkey sandwich should be this: a thin layer of mayonnaise, then several slices of turkey, then a generous smear of cranberry sauce, followed by an equally generous wodge of stuffing. A handful of potato chips on the side. Delicious! Dinner: a lentil soup, made from some sauteed purple onion and garlic cloves, the ham stock, a few bay leaves, the last bits of celery, puy lentils and a few big handfuls of chopped-up ham. doesn't that lovely pink and green look Christmassy? Couldn't be easier . 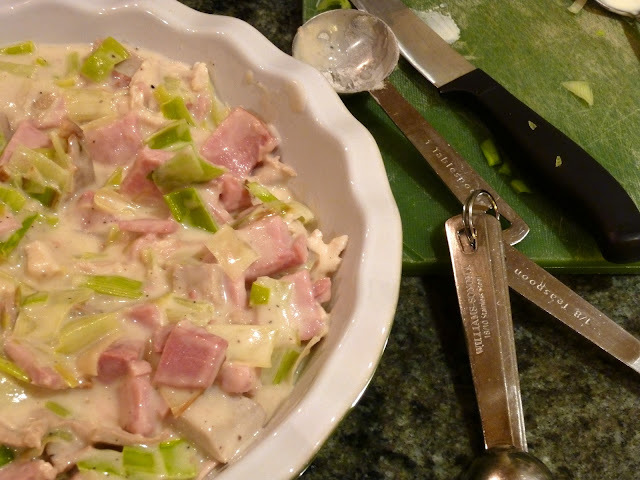 . . melt the butter in a large saucepan, and saute the leeks until soft -- but still bright in color. Add a couple of tablespoons of flour, and stir to thicken. Slowly add the stock and then the cream -- stirring until smooth. Let the mixture come to a boil, and then turn down to a simmer. Add the meat, some chopped parsley, and a grinding of salt (if needed) and pepper. Transfer to a pie dish and cover with pastry. The original recipe called for puff pastry, but I made a simple pastry with these proportions: two ounces of vegetable shortening, two ounces of butter, 1 1/2 cups of flour, a teaspoon of salt and a few tablespoons of iced water. Easy-peasy, and why not add peas? If you have any left-over. This project earned me a guest spot here. Of this I'm proud! It all started one afternoon at a hobby and craft superstore. I'd loaded up on some fabulous yarn and found the sculpting clay on a big discount. I was already a little euphoric when I walked past an end cap of adorable little Christmas-themed personal loaf crocks. I squealed as I kept up the spirited grab-and-growl behavior and filled my arm basket with seven of these little pans. Why seven? I have no idea. Yes, I thought I'd bake a little Christmas bread of some kind for some friends and colleagues, but did I count the people I'd need to bake for? No. I grabbed until I'd fetched all of my favorite snowman and santa and reindeer and angel pans. I wound up with seven. They were a dollar apiece. I smiled with satisfaction over how clever I was. I'd spend just a few dollars more on the ingredients for my as-of-yet unknown holiday sweet bread. And I predicted the delight of the recipients of my little made-with-love gift. I don't like nuts. Wait. Let me clarify. I love my sister and she's a nut. I like to eat a handful of just about any kind of nut. But I don't like nuts when they've been put IN other things. Best way to ruin a brownie or a gooey cinnamon roll? Add nuts. When I went in search of just-the-right holiday sweet bread for my festive personal loaf gifts, I had to wade through a lot of nuts. Fruitcake is just not okay. There's too much going on in there. This lovely little cranberry and orange bread has a lot going. The recipe called for nuts and I left them out to try to cut down on the chaos. I'll give you the recipe here with nuts included, just in case nutty chaos is your thing. Preheat oven to 375 degrees F. Prepare one 9x5x2¾ inch loaf pan; lightly grease the pan with shortening and dust with flour. Tip: to make baked bread easier to remove from pan, lightly grease the pan, line with parchment paper, and then lightly grease the top of the parchment paper and dust with flour. In a large bowl, combine sugar, egg, buttermilk, melted butter, orange juice, and orange zest; whisk together until well blended. Add flour mixture; stir just until blended. Add cranberries and nuts; lightly stir to mix in. Pour batter in the loaf pan. Bake 60 minutes or until a toothpick inserted in the center comes out clean. Remove pan from oven and let cool about 15 minutes. Grabbing the top edges of the parchment paper, lift bread from loaf pans and place on wire rack to finish cooling. Remove parchment paper and discard. A couple of notes about how I played by my own rules. I chopped those cranberries, as you can see, by hand. Not a fabulous idea. But after I gave them a couple of slices, I gave them a rinse. The pesky seeds jump around just like the cranberries and they washed easily down the drain. I also doubled my recipe. Had enough left over to make a few muffins for myself. Next time, I might sprinkle some coarse sugar over the top. That orange zest and those cranberries are pretty robust. They could use a little more sugar, actually. But I'm not a big fan of things that are overly sweet. Maybe a big loaf takes an entire hour to be done, but my tiny servings took 20 minutes or so before the toothpick came out clean. The sculpting clay is destined to make some more friends for these guys. During the month of December, my kitchen starts to resemble an eccentric, rather squiffy bakery. Of all of the Christmas traditions, I like the baking bits best; and I'm never happier than when in a warm kitchen, with Christmas carols blaring and fine dusting of flour and icing sugar covering every surface. This year, with both of our families coming, we've had more than the usual number of presents to buy. Because I've had the time to do it, (which is not always the case), I decided to go homemade for the presents for teachers, friends and neighbors. Christmas presents, what to do? A couple of weeks ago, I was at my daughter's parent/teacher conferences and mentally totting up how many teachers and various other support staff help educate this one child of mine. I lost track at 17, and that still didn't include the school secretary, headmaster, and other important people. (It was all so much easier when there was one classroom teacher and everyone clubbed together with a gift certificate.) I want to give everyone something, but it does tend to get out of control . . . in terms of money and effort. My solution was to make a huge platter of Christmas cookies for all of the office staff, and to make small boxes of English toffee for all of the individual teachers. This kind of Christmas baking is more unusual in England, and it always seems to be appreciated. (Her form tutor and the headmaster got a bottle of port, though. "A nice bottle" being more in line with this particular school's traditions.) 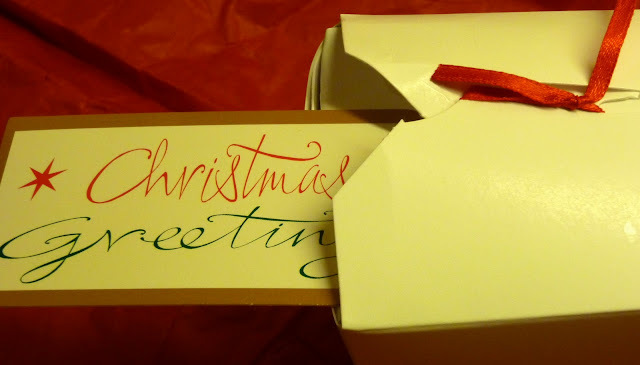 I managed to find white "Chinese take-out" boxes for 10 pence each, and with a tag and a bit of colored paper, the whole project was really economical. One batch of toffee filled 3 to 4 boxes . . . and although it did require making about 5 batches, I've made this particular recipe so often that I could probably do it in my sleep. I tend to stockpile trays and tins and gift bags, and then I can throw together gifts for friends. Some people will get a jar of mincemeat and a bag of spritz cookies, while others will get a tray of sugar cookies and gingerbread men. Anyone who comes to my house during the holiday season leaves with a takeaway bag of goodies from my pile of Christmas tins. 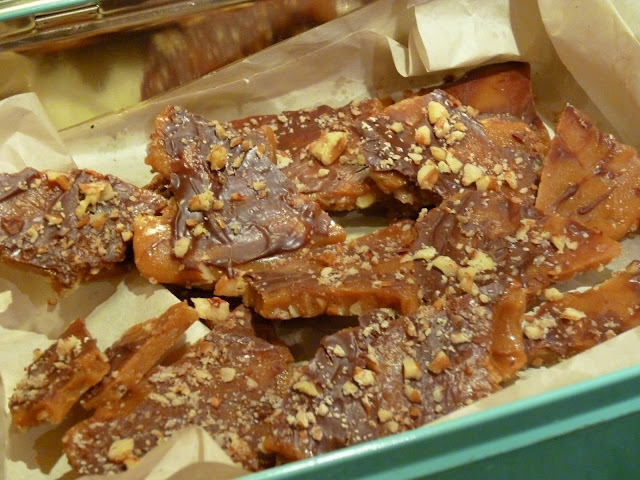 I don't know how many batches of English toffee I've made this year. I lost count a few batches back, and I will still make some for my sister-in-law's boyfriend -- who ate almost the entire dish of it two Christmases ago. Every time I go to the grocery store, (which is every other day), I buy at least three packages of butter. It might seem decadent, but I added up that a batch of toffee is not much more than two pounds to make -- and it makes a lot! What other good present can you buy or make for that price? You will need a nonstick pan of some sort. My mom always used a pizza pan, while I use a heavy nonstick cookie sheet. Sprinkle about half of the nuts evenly over the pan’s surface. Melt the butter and sugar in a medium-sized saucepan over medium heat. Stir continuously until the temperature reaches 295F/146C. You will need a candy thermometer for this bit – (and I like to have something to read as well) – as it will take awhile. Just like childbirth, time will seem to move really slowly and nothing will seem to be happening . . . but be careful and attentive at the end, because it will suddenly shoot up to the required temperature. Quickly pour the mixture over the nuts. Be extra careful – you do NOT want to get burned. You can smooth it out with a plastic spatula or wooden spoon, but do that straight away as it hardens up quickly. Let cool for a few minutes, and then sprinkle the chocolate evenly over the candy’s surface. The heat of the candy will melt the chocolate, and then you can spread it evenly. Finally, sprinkle the rest of the nuts over the chocolate. When the candy is completely cool, you can break it into small pieces. It will cool on its own, but it you are in a hurry (and sometimes I am) you can speed it up by putting it in the refrigerator for a few minutes. Store in an air-tight can . . . and don’t make it on a humid day! 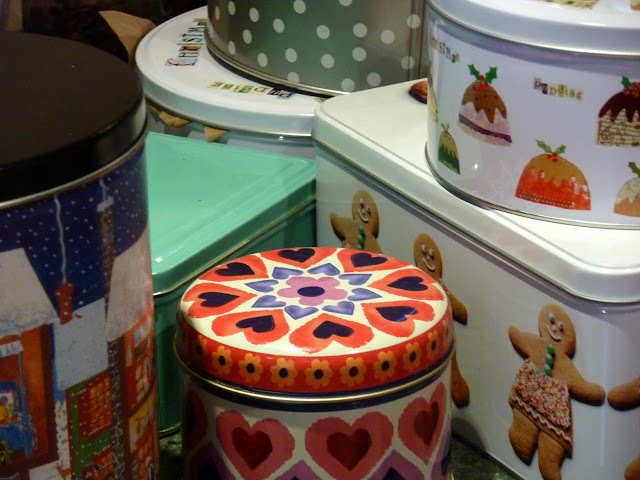 In the afternoon, as various members of the Christmas party drift into the kitchen to make a cup of tea or coffee, you can hear tins opening and closing. On offer: peanut brittle, Oklahoma Brown candy, English toffee, sugar cookies, gingerbread men, spritz cookies, cardamom cookies . . . oh, and Chex mix (imported from Texas; thanks, Mom). 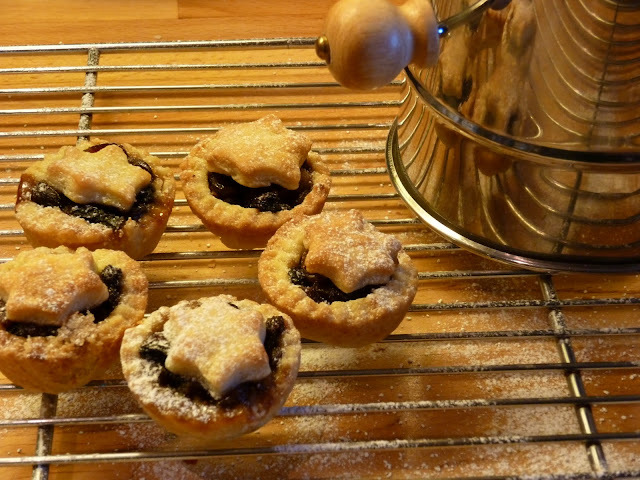 This afternoon, after I take a long walk in the snow, I'm going to make a batch of mince pies . . . to have with the left-over mulled wine from last night's party. As promised, a mince pie pastry recipe. Did anyone get around to making their own mincemeat? I discovered this recipe several years ago, and I haven't been tempted (yet!) to try anything different. Necessary embellishment: Icing (confectioner’s) sugar for dusting. Unnecessary embellishment: Egg wash (egg yolk watered down) for brushing over the top – if you think you need it, and I rarely do. Pulse the flour and the COLD fats in a food processor until fine and crumbly. Mix the salt into the orange juice and add it gradually into the flour mixture – just until the dough starts to come together. Remove from the processor, and bring the dough together into a ball with your hands. Make sure all ingredients are well-incorporated. Then divide into three sections, pat down, wrap in clingfilm (Saran wrap) and put in the refrigerator to “rest” for 20 minutes or so. Working with one section of dough at a time, roll out fairly thinly – but it should still be sturdy enough to make a pastry case. Lightly flour the surface you are working on – and also your rolling pin – but it is not a sticky or temperamental pastry. I use a fluted round cookie/biscuit cutter to make the discs which will line miniature muffin/tart pans. Then I make some little stars to put on the top. You might need to go with a glass (or whatever you have), as long as it makes a circle which will fit into the tart pan you are using. The dough should come all the way up to the top, but not overhang. This pastry is really easy to work with – and really flaky and delicious to eat. You can roll it out, and patch it, and mess with it, and it will still be tender. The orange juice is the master stroke – both for a hint of sweetness, and also for its tenderizing properties. Place a teaspoon or so of mincemeat into the pastry case. It should come almost up to the top. Put your little pastry star on top, and brush with eggwash if you want that golden, shiny look. Bake for 10-15 minutes in a very hot (220 C/ 440 F) oven. Ease out of the pans onto a wire rack after a minute or so of cooling. When the pies are cool, or even almost cool, sprinkle some powdered sugar over them. I use my flour sifter for this delicate job! For extra delicious decadence, spread brandy butter or rum butter on top of your mince pie. According to Nigella, these freeze well. I can't speak to that - as I never have any left over. I made 24 of them on Sunday, when we had friends over for lunch, and by the end of the afternoon they had all disappeared! They are very "more-ish," as the English say. I keep giving my mincemeat away, but I should have enough for at least two more batches -- and the mincemeat ice cream that I'm making for Christmas Even dinner. Just like at a wedding, I believe that every Christmas season needs "something old" and "something new." My something new this year was a recipe for cardamom cookies. I found this recipe in a magazine called More . . . which makes me laugh, as that could be the theme of this Christmas! I've never had so many friends and family for Christmas, and I've never baked so much. For me, that is saying something. Just whisk together these ingredients until smooth. Using a mixer, cream together the butter and the white and dark brown sugars until light and fluffy. Beat in one egg at a time, and then add the vanilla. Add flour mixture and mix until just combined. Don't overmix, but you do need for the ingredients to be thoroughly incorporated. Roll rounded tablespoonfuls of dough into balls and disperse evenly across your cookie sheet. (If you don't use silpat mats, you should put down some parchment paper.) Twelve cookies per sheet is about right. They will need between 9 and 11 minutes to bake. They should be firm to the touch at the edges and puffed in the middle. Cool on a baking rack. When the cookies are completely cool, you can add the glaze. I half drizzled/half smoothed my glaze with a spoon. Grate some nutmeg over the top for a final touch. Baker's Reward: a cup of strong coffee and two of these cookies and feet up in your favorite chair. Happy baking . . . and a very Merry Christmas to you all! the julefrokost or christmas lunch is an essential part of danish culture. in a work context, it's an excuse to eat too much, drink too much and have a quick shag in a dark corner with one of your coworkers. in the home context, it's an excuse to eat too much and drink too much and generally have a hyggeligt time. hyggeligt is always translated as cozy, but it's much more than that word in english conveys - it carries with it the glow of candlelight and the art of keeping a sustained pleasant level of drunkenness for twelve hours straight, something at which the danes excel. * several kinds of herring - usually one in a red wine vinegar, one in a tomato-based sauce and a curry one (a very mild curry, we are talking the danes here, so it's not a chili curry). * smørrebrød - danish open-faced sandwiches with toppings that include shrimp, boiled eggs, mayo and dill, fish filet with a yellow remoulade (in the tartar sauce family), creamy chicken salad with canned white asparagus (eewww), warm liver paté (leverpostej) topped with bacon and sautéed mushrooms and served with red beet pickles, a variety of hard sausages and various incarnations of ham served with the appropriate accompaniments (i'll do a separate post about all of this one day). * tarteletter - light, fluffy pastry shells filled with chicken and more canned white asparagus or mixed seafood in a creamy white sauce. * flæskesteg - pork roast with the cracklings on top, crisped to perfection, served with white and brown (caramelized) potatoes and red cabbage. * bowls heaped with mandarin oranges, nuts, dried figs, dates and apricots that you can graze on in between. * beer, snaps and loads of red wine. as you can imagine, it takes quite a long time to eat all of this and it's all eaten in a special order - herring and snaps first, then fish, chicken, then pork products cold, followed by warm pork products. and there are all sorts of rules about which kind of bread goes with which - herring on dark bread that's been spread with lard and shrimp on light bread. of course, the danes will tell you there are no rules, but you can be sure there are indeed rules when you can tell by looking around at the horrified faces that you've just violated them by putting your warm leverpostej on white bread. at the saturday julefrokost, there are ten couples involved and each couple brings a course. i bring something different every year, according to my mood (tho' i'm not allowed to bring dessert because there's an italian woman who brings tiramisu every year). one year it was a pepped up chili flæskesteg (because i can't leave the tradition well enough alone) and this year, i had the bright idea of making homemade pickled herring. the problem with making pickled herring is that you don't actually know how it's going to turn out 'til you get there with it, so if it's vile, i'll be in big trouble, as herring starts the whole thing off. i spent a lot of time searching for recipes and pouring over old-fashioned danish cookbooks and i arrived at two recipes. one called for poaching the herring in the oven with the vinegar/sugar solution over it and so it is actually cooked and the one (pictured above) calls for letting the vinegar do the "cooking" for me. for both recipes, i salted my fresh herring fillets (which i got from my fishmonger) and let them sit in the outside (now known as the herring) refrigerator for 24 hours. place the marinade ingredients in a pan and bring it to a boil. place the fish in an oven-proof dish (rinsing off the salt) and pour the hot marinade over, baking in the oven at 200℃/375℉ for 20 minutes. transfer the fish to a prepared, sterile jar and pour over as much of the marinade as will fit. refrigerate up to a week before use. i intend to use the poached herring recipe as a base for a herring salad with apple and creme frâiche. cut the herring into bite-sized chunks. mix the creme frâiche, chives, mustard, lemon juice and seasoning together in a bow, add the herring, apples and onions, cover and refrigerate for 4-5 hours. sprinkle with chopped dill and serve with rye bread. cut your salted, rinsed herring fillets into bite sized-pieces and stuff them tightly into a sterilized jar, layering in peppercorns, allspice, bay leaves and onion slices as you go. stir together the sugar and vinegar until the sugar is dissolved, pour over the herring filets until they are completely covered by vinegar. if you need a bit more than 250ml, add more vinegar until they are covered. refrigerate up to one week before serving on rye bread with slices of red onion and boiled egg. I'm trying to decide if steak and onion pie is better when the weather is cold and sharp . . . or cold and damp. No matter: if it is December in any northerly climate, this is the most satisfying dinner imaginable. My father's birthday is December 8 and it has long been our family tradition to make it on that occasion. When I was chatting to my mother this week I mentioned that I was making the pie . . . and she laughed and said that she had made one, too. It was always great in Texas, but I think that it may be even better in England. Of course meat pies are an English standard -- pub grub, and available year-round. But for me, this pie is a seasonal pleasure. My mother got it from an old cookbook, with a brown cloth cover -- and I can still picture the 50s era font. (I'm sure that some long-ago farmer's wife patented the special blend of spices.) It came from an earlier American era, when people had lots of outdoor chores to do. But even if your only exposure to frigid air is running from the car to the house, this comforting dish is just what you need this winter. Saute the onion in a tablespoon of vegetable oil (canola or similar). When it is translucent, remove from the pan and reserve for later. Mix together the flour and seasonings, and dredge the meat in the mixture. (I usually toss them in a ziploc bag.) Then, in three or four smallish batches, brown the meat strips in hot oil. You will need to add about a tablespoon of oil for each batch of meat. Place the cooked onions on the top, and let cool. 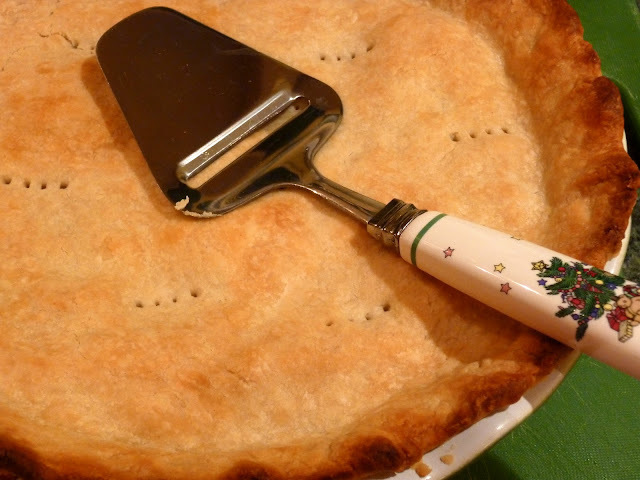 Then cover with pie crust -- not forgetting to punch some steam holes in the crust. Bake for 30 minutes in a very hot oven -- 450F/220 C.
You can easily double this recipe, and I often do. Cut the shortening into the flour and salt. Add just enough ice water to bind. When it comes together, form into a ball and chill for at least half an hour. If you roll it out between two sheets of waxed or parchment paper, you can just lift it -- and flip it -- straight onto the pie. Make sure the filling has cooled though, or it will start melting the pastry. You can prepare the filling beforehand, and keep the covered casserole in the refrigerator for 24 hours or so. 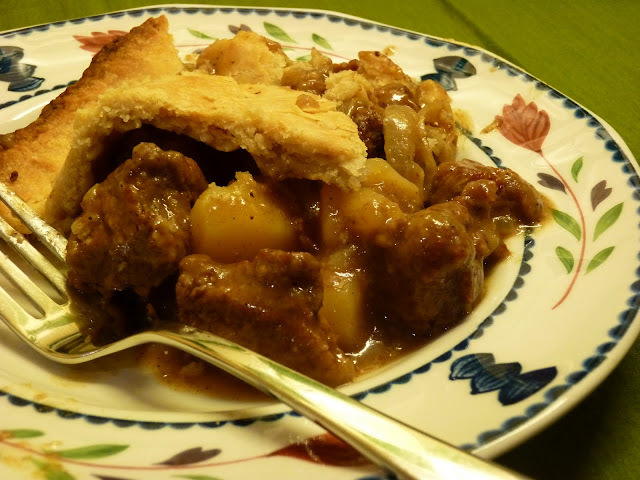 When you are ready to eat, add the pie crust and start preheating your oven. This pie isn't difficult to make, but it does take a while. It's not a dinner that you want to start making after 7 pm. Labor of love, though . . . definitely. Yesterday, when my ravenous teenaged daughter came looking for a snack, she demanded the left-over steak and onion pie. Even though our kitchen counter is loaded up with homemade cookies and candies at the moment, when it is dark and wet and you've had a long day there is nothing better than some warmed-up (and warming) meat pie. first i have to say that we are in the darkest time of the year here in denmark and that means that on the best of days, there's only good light between about 10 a.m. and 2 p.m. by 2:30, there's already a sunset quality to the light. most days are dark, overcast and very grey and it rains a lot and we don't see the sunshine for weeks on end. i'm explaining this for several reasons. one, it means my pictures all have the very golden cast of the artificial light combined with the yellow walls of my kitchen. and two, it means we take cover in the house, baking. especially here in the lead up to the holidays. 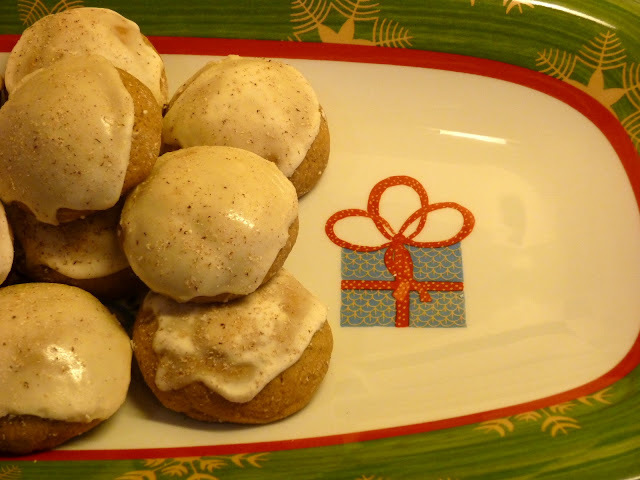 this weekend, we baked two family holiday favorites and we will bake them again before the season is over. the first is a holiday tea ring in a pretty wreath-shape that my mom always makes. the recipe makes two, one to keep and one to give away. it has festive candied cherries on top and is a delicious, slightly-sweet bread. it makes a good breakfast if you have any left the next morning, just slather on a bit of butter and drink with a steaming mug of tea (or coffee). put the yeast and the sugar down in your mixing bowl and when the milk/butter mixture is warm, add it to the yeast. allow it to dissolve and begin to work, add the eggs. begin adding the flour, one cup at a time. mix it well. if you use your kitchen aid, let the dough hook do the work, if not, you will need to knead the dough for about 5 minutes, then place it in a large, lightly-greased, floured bowl to rise until it's double in size. when it's doubled in size, divide it in half and roll it out into two rectangles that are approximately 18" x 7" (according to my mom's instructions), spread it with butter down the middle, sprinkle with cinnamon sugar (to taste) - we put quite a lot, then add a handful of raisins, pecans and cherries down the middle. since there is a little girl at our house that loves the cherries, but not raisins or nuts, we put only cherries in ours. it's really up to you. you could also put in other dried fruits - melon, apple, papaya, cranberries - whatever you like. join the two ends so that it forms a wreath shape and transfer to a baking tray lined with baking paper. use a scissors to clip 2/3 of the way in (that's not what i did in the picture - i did it wrong and only remembered how to do it correctly afterwards) every inch and a half or so. then take every other one of those, pull it up and twist it to make the wreath look more wreath-like. allow it to rise half an hour or so in a warm place, brush with an egg/water wash (if desired) then bake at 175℃/350℉ for 20-25 minutes (my oven seems faster than others, so you may need more time than this). make up an easy powdered sugar frosting and drizzle it over, decorating with cherries. i advise diving in while it's still warm. be sure to make a fresh pot of christmas tea to go with it. bake 200℃/400℉ 8-10 minutes. they do not need to be brown, but are quite pale. make 3 doz. balls. grandma always mashed them criss-crossed with a fork. when cooled, roll the cookies in sifted powdered sugar. try not to eat them all the first day. thanksgiving was nearly a week ago (bearing in mind we celebrated on saturday) and i think i'm still recovering. i've been cooking simply all week (thank you leftovers) and generally been rather low key. i think i used so much energy and concentration on the Big Meal that i lost my cooking mojo for awhile afterwards. i can feel it creeping back in today as i contemplate going to see what goodness my fish man might have today. as the week has gone by and i thought about my thanksgiving cooking frenzy, i realized that there was an awful lot of improvisation going on in the meal i cooked. it's not easy to cook a traditional american meal outside of the US, there will always be something you can't get (canned pumpkin, pecans, condensed milk, proper canned mushroom soup) and there will always be things (sweet potatoes, cranberries) you have to adjust to the palates you find in the culture before you and there will always be things (stove top stuffing, crisco, velveeta) you'd never allow in your kitchen anyway, even if you were in the US. and so you improvise. on the thursday before my thanksgiving, i picked up my turkey and then had a small nervous breakdown which you can read about here. but in the end, despite the issues i had with it, it turned out perfectly and was probably the best tasting, moistest (is that a word?) turkey we've ever had and so totally worth the small fortune that i had to pay for it. and no one even noticed the big spot i had cut out of the skin on the breast, they were so impressed with the sheer size of the bird (more than 10 kilos!) that they didn't even see it. i learned something interesting about my smeg stove. the turkey, as i said, was more than 10 kilos and although it fit, there wasn't a lot of extra room in there. and i think that after three and a half hours, the warm air oven, which is what i always use, didn't like that. i suspect it didn't have enough ability to circulate the air as it would have liked because the turkey was taking up so much of the space. so my oven went out. i discovered it when i went to take the turkey out and let it rest anyway, but i was pretty concerned (what with sweet potatoes, honey-glazed root veggies and corn pudding to go in) when i saw that the clock had gone dark. at first, i thought it had blown a fuse. the stove is on its own fuse, but i could see that it hadn't blown and the second, smaller oven was still working. it was just the big main oven. but i removed the turkey and left the door open for a few minutes, allowing it to air out. and the clock came blinking back on after about 5 minutes or so, so i could reset it and go on with the cooking of the other things. husband was standing by, ready to run to borrow the neighbors' ovens, but once it came back on, it was fine. but it's not exactly reassuring that such a wonderful oven (with a retail price of 27,000DKK (or more than $5,000) - tho' we got a much better deal on it than that) cut out when the going got tough, especially as it's only just over a year old. i used a pie crust that my mom said was one of my grandma's favorites - already there, i improvised because the recipe called for shortening and i substituted lard. i used my food processor (i'm all about easy) and added 3 tablespoons of ice water in order to bring it together. then i pressed it into a disc and refrigerated for an hour. i rolled it out and pre-baked it for 20 minutes before filling it with the filling. i always use a cookie cutter to make leaves or pumpkins since i'm rubbish at making those pretty pie crust edges. even tho' i had doubled the amount of pumpkin and eggs, the filling fit perfectly into my pie tin and it was definitely the favorite of the two pumpkin pies i made. this is the other one. what's interesting is that from tasting the batter, i thought the caramel pumpkin pie would be the best, but i think the walnut and brown sugar on top of this one made it unbeatable. Surely one of the chief pleasures of Christmas is the nostalgia bit: doing the same old things you've always done. Although every year brings unavoidable changes, there is something so comforting about established rituals -- particularly when they stretch back all the way to one's childhood. When it comes to holiday baking, I have three sentimental favorites that I must make or it just doesn't feel like Christmas. Gingerbread men. English toffee. Sugar Cookies. But even though my love for this sugar cookie recipe is a true love, and even though our relationship spans back nearly 40 years, I do still like to flirt. Not often, you understand, but very occasionally. Last week I needed to make cookies for my daughter's Christmas Fayre (sic), and I was tempted to stray by one of my most beguiling baking books: The Pastry Queen, by Rebecca Rather. My mother gave me this cookbook, and such was my love for it, that I insisted on making a specific pilgrimage to Fredricksburg, Texas, just to visit Rebecca's Rather Sweet Bakery and Cafe. When I am feeling homesick for Texas, or when I want a really over-the-top delicious recipe, I tend to reach for this favorite. The name -- Sugar Saucers -- caught my eye. Cookies are fairly rare at an English bake sale, and I knew that an oversized version would be popular with the kids. VFM (or, value for money) as my husband always says. Also, I couldn't help but be wonder if Rather -- a baking goddess -- had a better sugar cookie recipe than the one I've been making all of these years. Preheat the oven to 350F/175 C. If you aren't using silicone mats, you will need to grease your cookie sheets. Using a mixer, beat the butter on medium speed until creamy. Then, adding one ingredient at a time, add the oil, granulated sugar, powdered sugar, egg and vanilla -- beating well, until each ingredient has been incorporated. Stir in the dry ingredients (flour, baking soda and salt) all at once -- either using a wooden spoon or your mixer on a low speed. The dough will be very soft, and you will need to refrigerate it for approximately an hour -- or freeze it for 15 minutes, if you are in a hurry. When the dough has chilled, you can form balls -- depending on how large you want the cookies to be. A walnut sized ball of dough will give you a medium-sized cookie. Don't put more than 8 balls on a cookie sheet, as they will spread quite a bit. Rather recommends pressing the dough balls down with your fingers or palm, but I used a smooth-bottomed glass -- covered in sugar. Sprinkle the tops generously with sugar -- either granulated, or a colored decorator kind. I've made two batches now, and the first batch was slightly chewy -- while the second batch was delicate and crisp. A minute or two of baking time will make a difference, but both batches were absolutely scrumptious. 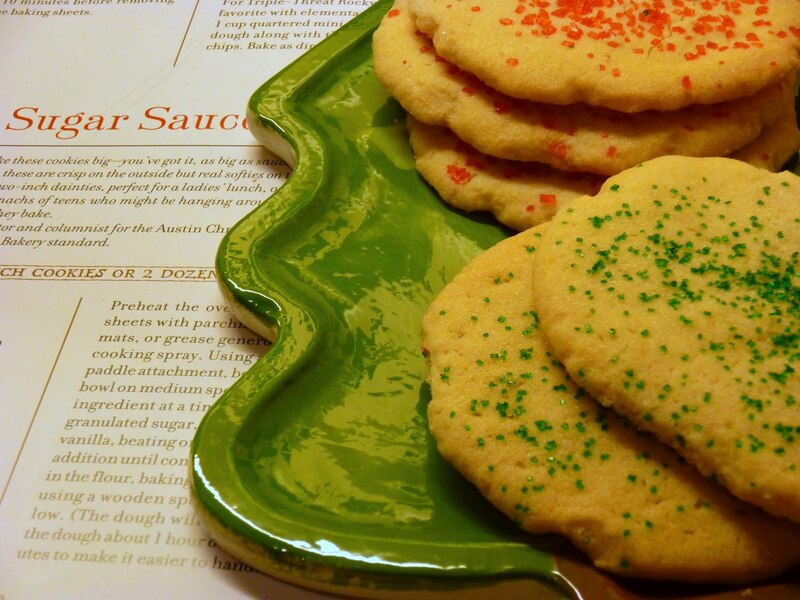 But are sugar saucers better than my own beloved sugar cookie recipe? Yesterday, I decided that I should perform a proper taste test. 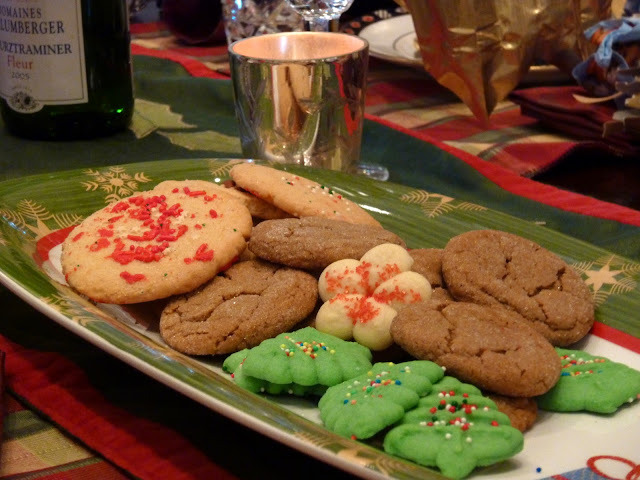 I made a batch of each kind of sugar cookie, and I invited a few tasters over for afternoon tea. After careful, considered munching, the verdict: both equally good. I won't stop making my sugar cookies, but there is always room for new traditions.